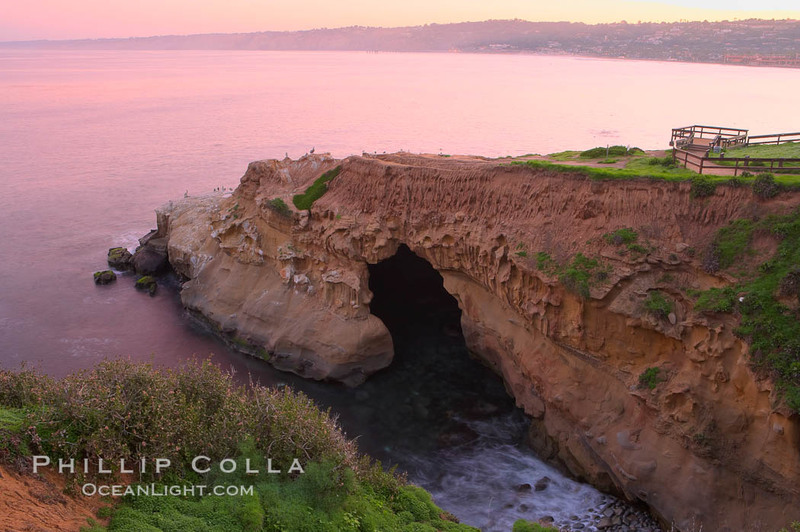 The biggest of the caves in La Jolla is seen here at sunrise. The other caves are around to the right. Atop this sandstone bluff are found many seabirds, particularly in winter when California brown pelicans (Pelecanus occidentalis) and cormorants can be seen here in their breeding plumage. Few birds appear in this image since this was taken in the cold hours before sunrise, but when the sun hits the bluff many more birds will arrive to warm themselves and preen throughout the morning. A large natural sea cave lies below a sandstone bluff in La Jolla at sunrise with a pink sky, Black’s Beach in the distant.